Helps us get to grips with 12 great truths that form the core of what it means to be an evangelical Christian. by Tim Thornborough et al. 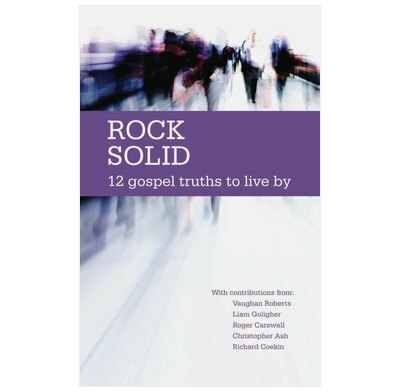 Rock Solid aims to help us get to grips with Christian truth and helps us to see that these truths are not just for knowing in our minds but for acting upon in our day to day lives. If faith is not lived out, it is worth nothing. This book explains and clarifies these important and powerful doctrines, or ‘themes’, of the Bible so that we might have the comfort and assurance that comes from them, and so that we can make our life decisions by them. Each chapter focuses on one of these truths and includes a short Bible study and discussion questions aimed at stimulating our thinking and encouraging our action. Brief contemporary stories are also included to show how these particular truths have been used by God, either to bring men and women to Christ, or to teach them something of His ways in their lives. This is primarily a book to be worked through. It is written in the hope that it will not simply be read straight through, but, in men’s or women’s groups, or informal small groups, it will be used as a means of getting a clear hold on the truths that define who we are as followers of Christ. There is little in the content that applies only to men, and so it actually turns out to be a very handy brief guide for Christians of all genders and stages of spiritual growth. Doctrine is never dull in this short and clearly-written book. Glancing down the list of contents may fill you with dread but the (many) authors bring things like justification, penal substitution and the sovereignty of God to life. Throughout the text there is a clear biblical basis given for each gospel truth and there's even a little Bible study in each chapter to help you go to Scripture and think things through and apply them personally. One of the highlights is that most chapters also contain mini-biographies of key church figures from across the ages which shows the way in which they have developed or defended the doctrine under consideration. A really helpful intro to some important and practical gospel truths.